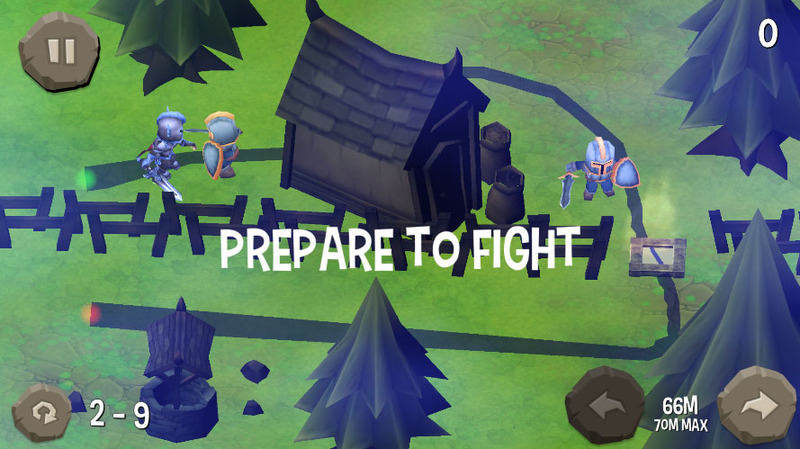 As I said before, once I decided to add a new game mode featuring a warrior in High Dragon, I realized quickly that I would have to create some kind of a fight system. At first, the idea was that the warrior mode would be more about solving puzzle. So, I decided to go with something simple for the fight. When the warrior would encounter a soldier, he would have the liberty to strike the soldier as many times as needed to kill him or to abandon the fight. Strikes would just be the animation of the warrior swinging his sword, and the soldier getting hurt. In this early simple version, there was no risks involved in getting into a fight. There were no GUI either, just character animations. Even before I started I knew it would need to be improved but the final result was less than satisfactory. It was even kind of boring to fight ! That was not acceptable! However, the fight system stayed in that state for a few weeks (out of 3 months of dev, that's a lot) because it allowed me to continue to create levels and tests them. The idea was this: if the level is fun or ok even with a bad fight system, it'll probably be good once the fight is fun too. Furthermore, keeping the "bad" fight system for a while gave me some time to think about a new system. During a diner with 2 friends, I showed them the prototype and we discussed fight system ideas. Among other ideas, one of them suggested something "simple" like Zelda 2 with the ability to kind of dodge in a simple manner. I could not see how to use this in my game though... I can't remember who suggested the use of Quick Time Event (QTE). Someone (I think it was me) suggested to use the idea of a circle shrinking above a disc and taping the disc when the circle is above it. So, as I always do, I went to build a rough prototype with rudimentary animations and no fx in a few hours. 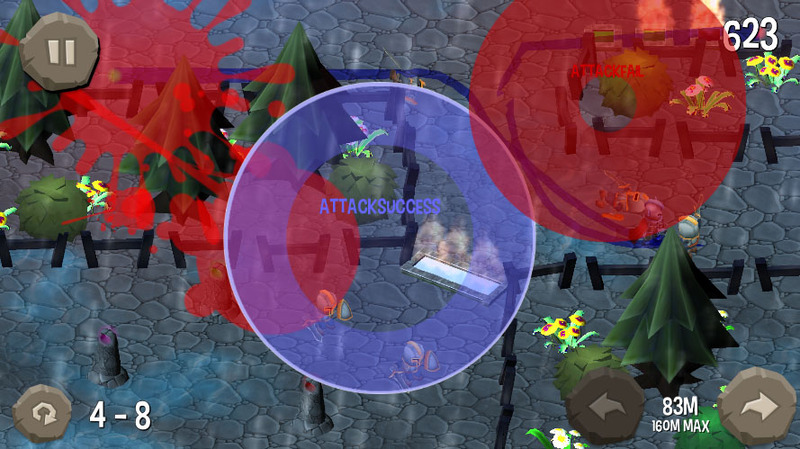 Along the dev I thought "it would be cool to have a circles for attack and for defense!". So I did just that. As a good former paper-RPG player, I also incorporated a system of critical hit if you hit the circle at the exact middle of the disc. I kept this system for a few weeks to see how it felt in the long run. I ended up noting one major flaw: the attack/defense system was confusing and unbalanced: failing an attack had no consequence while failing a defense meant trouble. It's much simplier but it immidiatly felt more intuitive and logical. Another thing bothered me: there was no risk in trying to get a critical hit and it was easy to get one by simple chance. So I changed that too: you now get a critical hit by tapping when the circle in on the borders of the disc. You take a risk of tapping too soon or too late but, if you succeed, you deal more damages and get more points. If you fail, you get hit (and loose the "no damages" bonus of the level). And this is pretty much, in a nutshell how you got what you have in High Dragon: A Warrior's Path. I had many other ideas of fight system. One of them involving a "Street Fighter" kind of system. However, it implied the creation of a new game mode, so, to keep to the schedule, it was rejected for an easier fight system that could be prototyped in a few hours. As you can see, even though the system was prototyped in a few hours, I ended up spending hours of thinking and tweaking on it. It's normal, but if it takes days or weeks to prototype a fight system, I let you imagine how long it will take to finetune it! As I write these lines, High Dragon is available on Androis and iOS, and I guess we'll see in High Dragon 2 how all this will evolve! I intend to spend a few days thinking about the new features I'll add to the game.